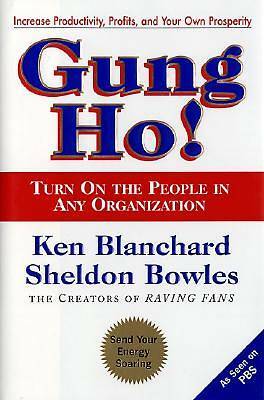 < P> Ken Blanchard and Sheldon Bowles, co-authors of the < I> New York Times< /I> business bestseller < I> Raving Fans, < /I> are back with < I> Gung Ho < /I> Here is an invaluable management tool that outlines foolproof ways to increase productivity by fostering excellent morale in the workplace. It is a must-read for everyone who wants to stay on top in today's ultra-competitive business world. < /P> < P> < I> Raving Fans< /I> taught managers how to turn customers into full-fledged fans. Now, < I> Gung Ho < /I> brings the same magic to employees. Through the inspirational story of business leaders Peggy Sinclair and Andy Longclaw, Blanchard and Bowles reveal the secret of Gung Ho--a revolutionary technique to boost enthusiasm and performance and usher in astonishing results for any organization. The three principles of Gung Ho are: < /P> < P> < i> < UL TYPE=DISC> < LI> The Spirit of the Squirrel< LI> The Way of the Beaver< LI> The Gift of the Goose< /UL> < /i> < /P> < P> These three cornerstones of Gung Ho are surprisingly simple and yet amazingly powerful. Whether your organization consists of one or is listed in the < I> Fortune 500, < /I> this book ensures Gung Ho employees committed to success. < /P> < P> < I> Gung Ho < /I> also includes a clear game plan with a step-by-step outline for instituting these groundbreaking ideas. Destined to become a classic, < I> Gung Ho < /I> is a rare and wonderful business book that is packed with invaluable information as well as a compelling, page-turning story. < /P> Management legend Ken Blanchard and masterentrepreneur Sheldon Bowles are back with < I> Gung Ho , < /I> revealing a surefire way to boost employee enthusiasm, productivity, and performance and usher in astonishing results for any organization.< P> < I> Raving Fans< /I> brilliantly schooled managers on how to turn customers into raving fans. < I> Gung Ho < /I> now brings the same magic to employees. Here is the story of how two managers saved a failing company and turned in record profits with record productivity. The three core ideas of < I> Gung Ho < /I> are surprisingly simple: worthwhile work guided by goals and values; putting workers in control of their production; and cheering one another on. Their principles are so powerful that business leaders, reviewing the manuscript for Ken and Sheldon, have written to say, "Sorry. Ignored instructions. Have photocopied for everyone. I promise to buy books, but can't wait. We need now " Like < I> Raving Fans, Gung Ho < /I> delivers.